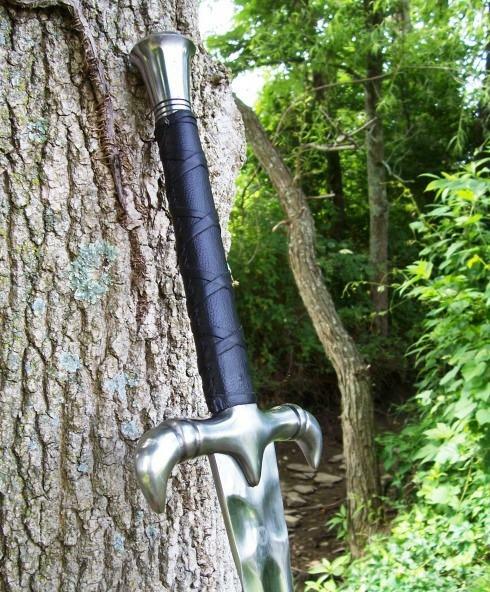 Made of 5160 Spring Steel steel, beautifully tempered and about as tough as they come, not only does this sword look incredibly mean, but it IS incredibly mean. My Name 'Woodard" was originally derived from the Old English words "wode", meaning wood, and ward "Guardian". In other words it was a name given to a forester, a guard, or a protector. An historical usage of the name goes back to the battle of Hastings, where one Commander "Woodard", was granted lands by King William for his assistance during the battle. I have owned my security guard business for over 15 years and enjoy hunting and hiking in the woods, so perhaps it must run in the family?!? 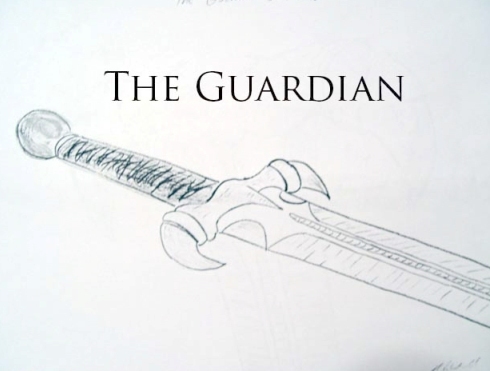 Anyway, the Guardian was something I would want in a sword if I could have it my way. I worked on the design many times re drawing in maybe more than thirty times. I’d change things here and there til I thought I had come up with a great well balanced sword. Last year when the sword competition was started at the sword buyers guide forum. 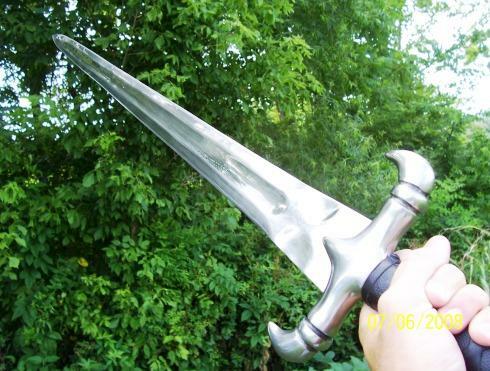 I mailed in my full size drawings of the Guardian fantasy sword to "Jason" at "ArmsofValor". He told me he did not have a way to scan the full size drawing for the others to vote on but he loved it and that it would be made after the winners swords were finished. Well time passed. And with Jason's' blessing I sent the design to "Darksword-armory". Eyal the owner loved it also and the rest is history.. I came up with the Receding cut outs myself back when I was working on the Sleepy hollow sword. 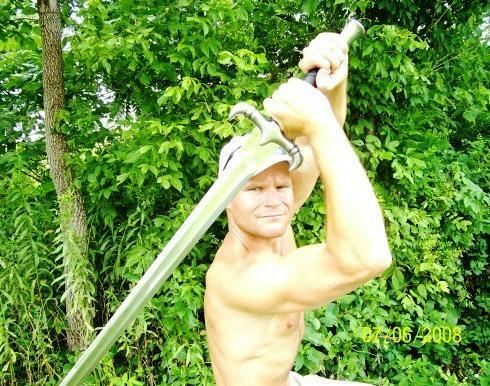 I always thought that would be the one weak spot of that sword. So I came up with the receding ones. 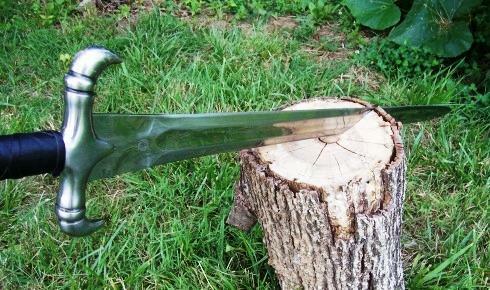 This helped to drop a little weight and not weaken the blade at all, plus it just looks cool!! I think this is the first fantasy sword that has this?? I was away from home when UPS dropped it at the house. When I got home I could not wait..Would the Guardian be everything I had dreamed of in my design? Would DSA get it right?? After removing the heavy packing and re moved the heavy amount of oil protecting the blade I took it outside in the sunlight. 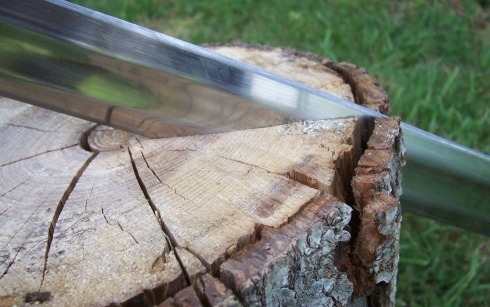 The leather grip has a cross pattern and feels very comfortable when the blade is in use. 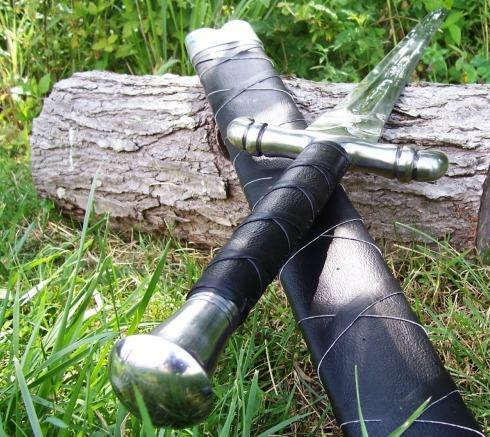 The Guardian fantasy sword also comes with the matching scabbard with the same cross leather pattern. I got a good feel for it.. 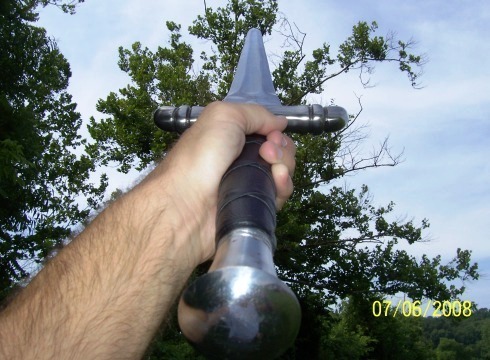 Swung it a bit I was very impressed with how balanced it turned out.. You can use one or both hands with this sword.. It balances about 3 inches from the guard!! 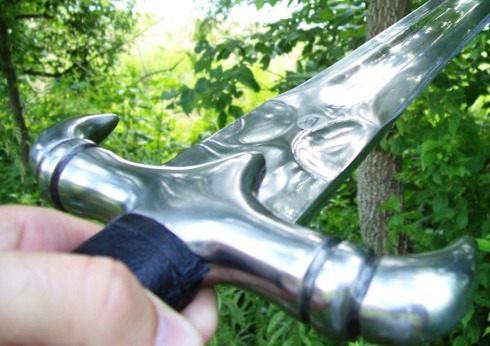 For a large sword it recovers well and flows like a much lighter sword. I used my Accusharp on a vice. 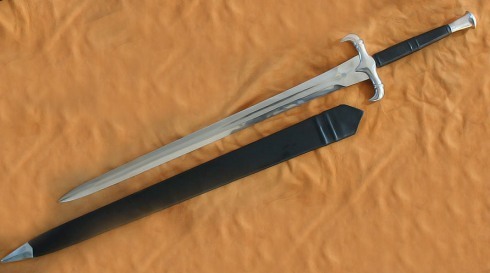 This sword seems to have a much more refined edge than older Darksword models - it only took about 18 to 20 min`s each side and I was ready to roll.. (Editors Note: Darksword blades now come with an optional sharpening service, giving it a razor sharp edge if so desired for a nominal fee). Now I was ready for some testing.. I cut through them all in one swing. Swoosh!!! Not to use a cliché, but it really felt like I was cutting through butter. Next up was a seasoned hickory stump.. I gave it 3 or 4 good hits.. It sank in pretty deep each time.. And the blade was fine, nary a scratch!! Next I set up a 5 gallon impact resistant water jug filled to the top.. I did make a mistake and hit the wrong button on the video camera.. So the impact was missed.. 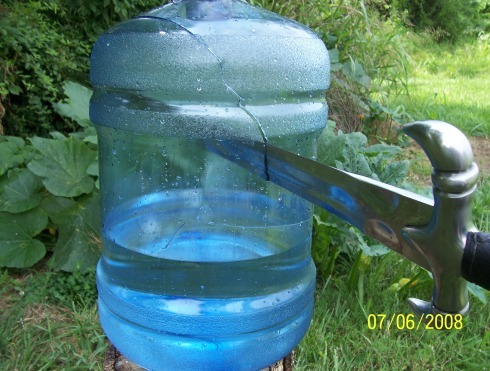 I did take a pic to show how deeply the Guardian sank into the bottle with one swing..
After testing this sword, I’m so proud!! It held up!! The fittings all stayed tight, and it cuts deep and can take the punishment that a sword should not have to..
UPDATE AND IMPROVEMENT: The most recent generation of this sword includes several improvements to the polish of the blade, the scabbard and - perhaps most importantly - the handle wrap, which I personally found to be a little bit loose, but has since been replaced with a much nicer leather wrap over cord. 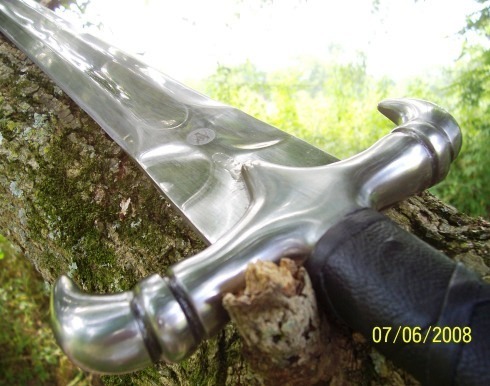 See pics of the sword in the store for more info.